Don’t really fancy the unbearable heat of Austin, Texas? Perhaps a great British summer holiday at some kind of seaside resort for your musical holiday needs? Don’t you be looking at Blackpool, don’t peek at Clethorpes and for your own sake, avoid Skeggy at all costs and head on down to Brighton sharpish. Oh and lucky you, you’ve arrived on the week of possibly the UK’s reply to America’s South By Southwest, the Great Escape. Now while SXSW may be the hippenin’, happenin’ place for new music in America, the Great Escape gives you just as good a line-up, for a far better price, right on your doorstep. (Well, sort of, if you don’t live in Brighton.) With artists like Florence and the Machine and Friendly Fires starting their careers off right on Brighton’s shores, it’s not difficult to see why the Great Escape has such a fantastic reputation in the musical community. Ed Sheeran, Katy B and the Vaccines were all some of the *little* artists to play the festival last year and now, well haven’t you heard, they’ve done quite well for themselves. This year, the headliners are Maximo Park (Thursday 10 May; pictured above), the Temper Trap (Friday 11 May) and Africa Express Sound System (Saturday 12 May). Lower down the bill up and coming talent from the likes of faux nerd rockers Spector, Camden-based rockers Tribes, as well as established bands like Sheffield’s Crookes and Scots We Were Promised Jetpacks. Newly added artists to the line-up include Scroobius Pip’s buddy Dan le Sac, French Films and We Have Band, who released their new album ‘Ternion’ earlier this year. So if you fancy some exciting new music on the seaside, then pick up a weekend ticket for the bumper price of just £49.50 or a day pass for substantially less. Visit the Great Escape official Web site for details on tickets. Described by MOJO as “Brighton’s answer to SXSW” and “…a cornucopia of vital new music and conferencing for industry pros”, the Great Escape has announced its first group of bands. The festival will take place 10-12 May 2012 in venues across Brighton. 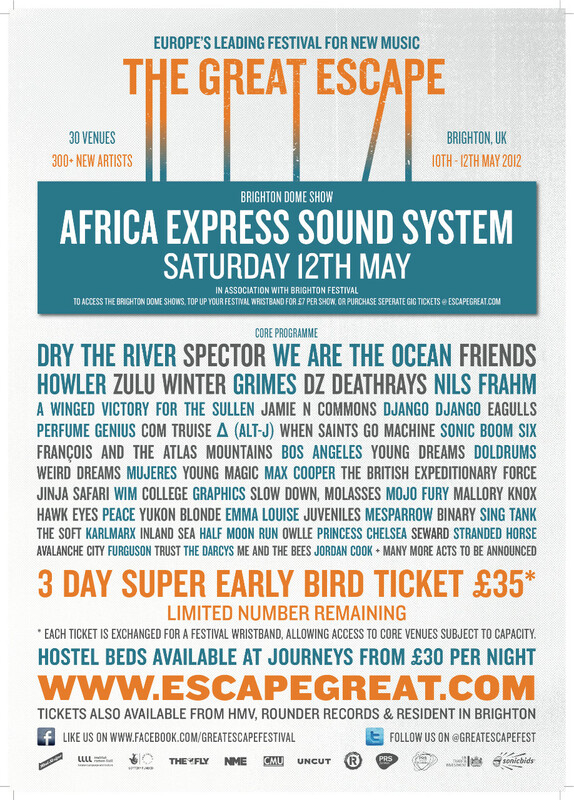 Included in the initial line-up are Saturday night headliner Africa Express Sound System, hotly tipped bands Dry the River (pictured above) and Spector, as well as eclectic dance rhythm specialists as Django Django (whose song ‘Default’ is currently on the 6music A-playlist), Grimes and Danes When Saints Go Machine. American acts scheduled to play include Rough Trade signing from Minneapolis Howler, the cutesy-named acts Bos Angeles and Com Truise and Perfume Genius, whose video was recently banned from YouTube. For more information on the bands announced yesterday, you can play with the interactive poster below. The full line-up will be released in March. Super early bird tickets for a 3-day wristband, at the bargain price of £35 plus booking and handling, are super limited now, so act quickly to avoid disappointment. Tickets for Africa Express Sound System’s show at Brighton Dome alone on Saturday 12 May is £18.50 plus booking and handling; a wristband top-up to include guaranteed access to this show is £7; a combined 3-day wristband plus guaranteed access to this Dome show is £41. Stay tuned for announcements on pricing for single day tickets and tickets for the other headlining shows (currently TBA). For all information on pricing, visit the official ticket page for the Great Escape.